Want to have your say on seismic testing, drilling off the NC coast? Thursday’s your deadline. If you enjoyed the beach over the long holiday weekend or have plans to go to the coast later this summer, you owe it to yourself to read Lisa Sorg’s new piece on the main Policy Watch website. 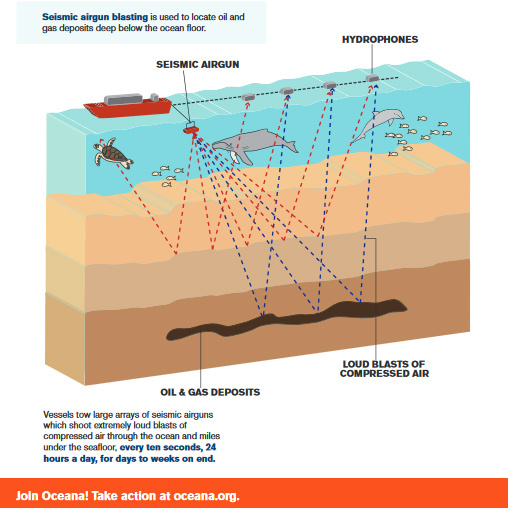 Sorg details the latest plans for seismic testing and offshore drilling, along with details on how you can weigh-in this week to protect the Atlantic Coast. The Atlantic Ocean has never been a silent place, what with the whales and their jabbering, the dolphins and their mating calls. The underwater sound waves of earthquakes, volcanoes and waves are background noise, akin to the hum of air conditioners in the summertime. And now, the air guns. The National Marine Fisheries Service is considering allowing energy companies to fire seismic air guns up and down the Atlantic Coast in search of oil and gas. The ramifications for marine life are dire. Read Sorg’s full story here. For more on the dangers of seismic testing, listen to Chris Fitzsimon’s recent radio interview with Blakely Hildebrand with the Southern Environmental Law Center. The deadline for commenting on seismic air gun blasting is this Thursday (July 6th) at midnight. 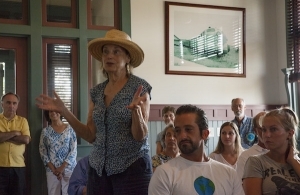 Written comments should be addressed to Jolie Harrison, Chief, Permits and Conservation Division, Office of Protected Resources, National Marine Fisheries Service. Comments can be sent to via email to ITP.Laws@noaa.gov or through the mail to 1315 East-West Highway, Silver Spring, MD 20910. Seismic drilling in the Atlantic is a deplorable idea. It will seriously harm and kill much oceanic wildlife, including whales, dolphins, sharks and many fish species. It should not ever be allowed!!! We have a beautiful coastal area and tourism is a large part of the coastal economy! This testing will harm many species that support our fishing industry! Studies have shown that plankton and phyto plankton are also destroyed! In addition, we do NOT need this oil! This is another attempt to pander to the corporations that donate to the republicans! We only have one planet; this is a danger to our state and planet! The citizens oppose this, but I doubt that it matters! please protect our beautiful coastline, thus protecting the families ,commerce, and wildlife that depend on a clean, healthy environment…perhaps the greatest natural resource our state has the duty to protect!